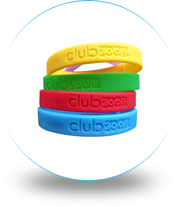 Screen-printed wristbands, also referred to as “silk screen” or “imprinted’ wristbands, are the best option for those looking to print a detailed, comprehensive and/or multi-color design/logo. 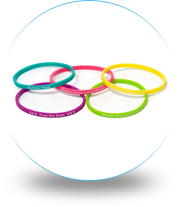 With screen-printed wristbands, your message/design is silk-screened directly on 100%, non-allergenic, silicone bracelets. Using screen-printing techniques, your message is neither raised (embossed) nor recessed (debossed) but instead, is smoothly printed onto the top layer of the wristband bracelet, similar to printing on paper. 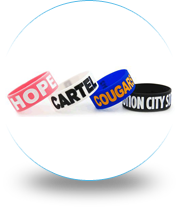 With screen-printed silicone bracelets your possibilities are endless! 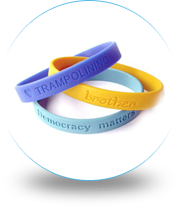 Screen-printing onto the wristbands is the only option available for graphics and logos that have overlapping colors and/or multiple colors side by side (for example, an American Flag). 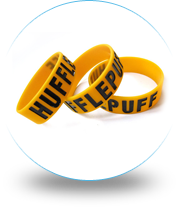 Choosing silk-screening for your custom silicone wristbands is also the optimal choice for designs with thinner and smaller fonts. 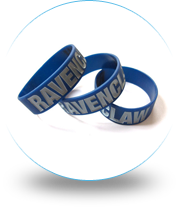 As with all of our customizable wristbands, you can choose from our large inventory of stock clip art or provide us with your own graphics. You also have the option to choose any Pantone color for your embossed wristbands and your message! Not sure which option best fits your needs? Call us at 1(800)715-4445 and speak to one of our representatives now! For your convenience we are available 5 days a week and, are always happy to answer any questions you may have. 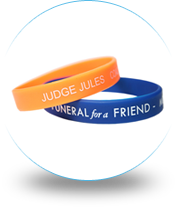 We provide up-to-date information regarding our customizable wristband products, and will gladly assist you in choosing the best custom silicone wristbands for your cause, event, brand, group, team, charity, etc.